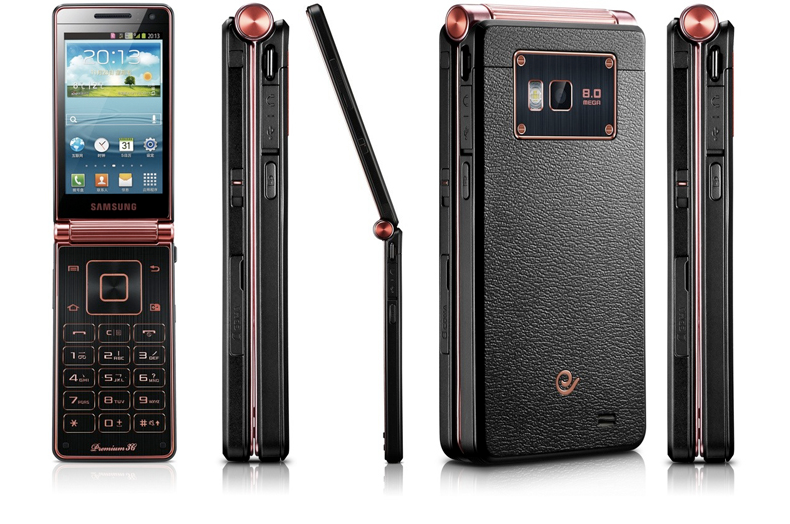 Looking for a state-of-the-art Android flip phone? Of course you aren’t! The world loves retro styling. Type the word retro into Google and you get a ton of autotype options as the search engine tries to guess what you were going to type next – clothes, games, furniture, and even sweets. Our desire to buy new old products even extends into consumer electronics, with amps, radios, and decidedly not-very-old CD players all coming with styling by your great-grandfather. Smartphones almost escaped the retro styling craze. For years, hipsters were forced buy actual old phones with a tenth of the functionality of a modern device, just so it matches their vintage shirt and Wayfarer sunglasses. However, a new leak hints that Samsung may be about to change all this. It shows a device called the Samsung Galaxy Folder, and it’s a flip phone. The image shows a phone with a 50/50 split, with the top half taken up by a screen and the lower half with a numerical keyboard and a massive D-pad. Android is displayed on the screen, complete with the Galaxy S3-era TouchWiz user interface. Apparently, the phone will be powered by a dual-core Snapdragon processor, Android 4.2.2 Jelly Bean, and the screen will have a 480 x 800 pixel resolution. At first, we dismissed it as an obvious joke. Why would anyone still want a smart flip phone? Think about it, when was the last time you dialed a telephone number? Maybe it was to add in a new contact, but at the time, did you think, “My, this touchscreen QWERTY keyboard is far too awkward – if only I was typing to my friends using T9 on a numerical keypad?” How about when you were playing Angry Birds? Was the big, spacious widescreen screen just too convenient? When Apple built the iPod, it didn’t add in a cassette player for fun, because the iPod replaces the CD player. In 1966, James T. Kirk would contact the Enterprise using a flip-up communicator. Twenty-five years later, Jean-Luc Picard only had to tap his Starfleet insignia to get in touch. When it comes to technology, old crap is fun to look at and remember, but it’s often insanely impractical. Do you really want to use rotary phone service when you have touchtone? Imagine typing a number in on your iPhone and having to wait several seconds between numbers? Yeah, no. If retro lovers want to live in the past, then they should put up with the inconvenience. If retro lovers want to live in the past, then they should put up with the inconvenience. The Galaxy Folder’s physical flip down keyboard is Samsung’s version of the live rear axle fitted to the 2012 Ford Mustang. Live rear axles are what we used in the horse and carriage days. It’s a feature nobody asked for, and one which was, technologically speaking, sent to the scrap heap many years ago. The touchscreen has replaced the physical keyboard on our phones because it’s better, and no-one needs to buy a phone with a 10-year old design to realize this. Should it be called the Galaxy Folder? No, it’s the Samsung Galaxy Anachronism. It’s a gadget that makes no sense in the world of today. It should be in an episode of Doctor Who. Unfortunately, while researching we discovered this isn’t a joke or a leak, though it’s being reported as such. Samsung has already released the phone in the picture under the name of the SCH-W2013. It wasn’t in 2003 either, but at the end of last year, when it was rather bizarrely promoted by kick-flick star Jackie Chan. What the photo doesn’t show you is the second screen on the outside of the flip, or the quad-core processor inside. Double screen or not, we’re thankful the W2013 never made it out of China, so we’ve not had to deal with queues of hipsters outside AT&T desperate to be the first to flip open an Android phone. So, it’s with great pleasure we’re debunking the Galaxy Folder rumor, or at least if it does exist, it’s not the phone pictured in the leak. We’re not sorry, either. We prefer obsolete hardware stayed where it belongs – in the past.